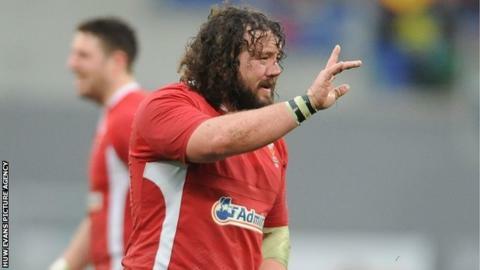 Wales centre Scott Williams says he is surprised that Adam Jones has retired from international duty. The 33-year-old prop announced his retirement after being left out of Wales' Six Nations squad, having been omitted for the autumn Test series. "I was a little bit surprised but Adam has been a world-class prop over the last couple of years and he's done a lot for the country," Williams said. "It's obviously his personal decision but he's got a lot left in his career." Williams is currently in training camp with Wales ahead of their Six Nations opener against England on 6 February. The 24-year-old, who has won 27 caps, is vying for a starting midfield berth along with British and Irish Lions pair Jamie Roberts and Jonathan Davies. England have several new injury concerns ahead of the game in Cardiff, with Owen Farrell, Kyle Eastmond, Geoff Parling and Tom Wood all hurt during a hard-fought weekend of European action. But Williams believes that England still have plenty of strength in depth and Wales cannot be lulled into any false sense of security. "They have had a few injuries but they're still a world-class side and they're going to take some beating," said Williams, whose Scarlets side lost at home to Toulon on Saturday. "So we've got to make sure we work hard in the next 11 days if we want a chance to win."